There’s an episode of Modern Family where in the midst of spring-cleaning, Claire begins to regret throwing out so many mementos from her children’s lives. Phil then loads the family up and takes them to the storage unit he’s secretly rented where he has hidden everything that he was supposed to cart away. It serves as a poignant reminder to hold on to things that make a mark in our lives while also recognizing their place in your everyday life. The storage unit is a strange enigma in our society. It serves as a place to keep things that are important enough to hold on to but too much of a hassle to have in our homes every day. A unit is more than a place to just throw out the stuff you don’t want until it’s warm enough for a yard sale; it’s a place for memories. Things like Christmas decorations, baby beds, or those bookshelves that you swear you’re going to paint and re-use one day. Treat it with the same respect you would your home and it will be there for you as a comfort instead of a hassle. With that in mind, here are tips from Beltline and Security Storalls on keeping your storage unit organized in 2018. Just like your home needs a good spring-cleaning, so does your storage unit. Chances are that doing a good clean in your home means you’ll be making a trip to the storage yard to add more inventory to the space. Before just throwing stuff on top of stuff, filter through and get rid of anything that is just taking up square footage. If you are keeping boxes of clothes that don’t fit anymore or that blow up Santa that hasn’t worked since last New Years Eve’s firework show, get rid of that stuff to make room for the things you really want to hold on to. It seems like a great idea, keeping everything out in the open to make it easy to find when need, but this never works out as planned. Eventually you’re tripping over an old stroller while trying to see past the surfboard to find the pair of shoes perfect for the costume party. If everything is boxed, yes it means that you’ll have to open boxes to get what you need but it also means you can go straight for what you need. Knowing what’s where will help when you’re in a rush. In that same vein, keep those boxes separated accordingly. Have one corner allotted for baby clothes and one stack just for your grandmother’s china. If you find yourself with a large quantity of one thing, then it might be worth renting a unit to keep it all together. Taking a little bit of time to organize this way will save you much time and headaches down the road when you aren’t pawing through hundreds of baskets looking for one particular item. It doesn’t matter what is in storage if you can’t actually get to it in the first place. When packing the unit, give yourself a pathway. Allow for some wiggle room to reach everything that is there. This keeps you from having to unload the entire unit for one box in the back. 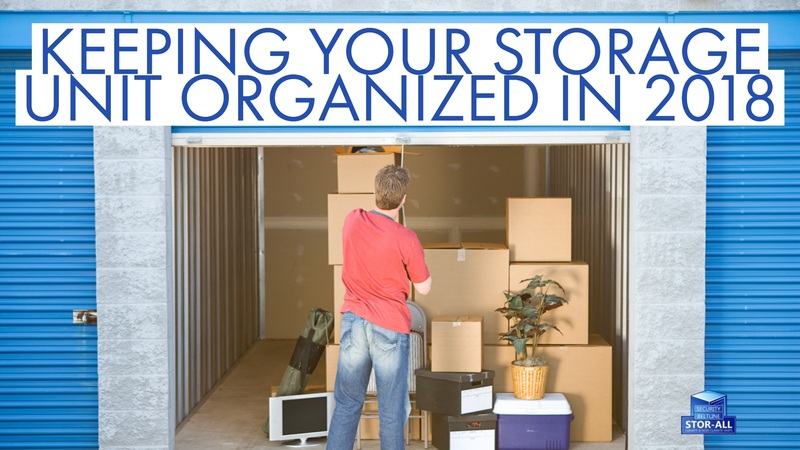 Keeping your storage unit organized will keep your life organized in 2018. 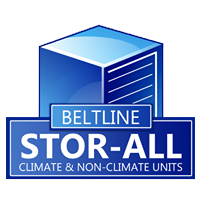 Use these tips from Beltline and Security Storalls and you’ll find yourself thankful the next time you make a trip to the storage yard.